Faster than writing a check. Easier than carrying a lot of cash. Cincinnatus is pleased to offer the Cincinnatus CheckCard in combination with our checking account programs. The Cincinnatus CheckCard can be used instead of a check at over 16 million stores, hotels, restaurants, and other businesses around the world. Once you use the card and see how easy it is, we think you'll keep your checkbook at home. Your Cincinnatus CheckCard can be used instead of a check at any merchant displaying the Mastercard® logo. You give your card to the merchant like a credit card, sign the receipt, and you're finished. The purchases are deducted from your checking account, which means you don't pay interest charges on the things you buy. Your monthly statement will have a detailed explanation of the transaction that includes the date, the amount, and even the name/id number of the merchant where you used your Cincinnatus CheckCard. 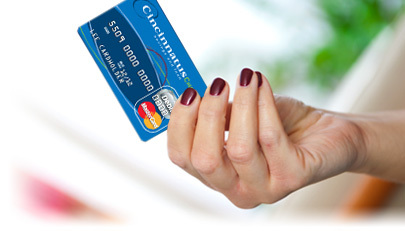 Your Cincinnatus CheckCard also has all the features of a typical ATM card. You can use the Cincinnatus CheckCard to get cash at any ATM which features the Pulse®, MoneyPass®, or the Cirrus® logo. Click schedule of fees for ATM charges. You can still write checks when you shop, although once you see how much more convenient it is to shop with the Cincinnatus CheckCard you will probably use your checks less and less. For information on our checking account offerings click on Checking Account Overview. For additional information on the Cincinnatus CheckCard call (513) 661-6903 or email us at savings@cincinnatussl.com. To apply for a Cincinnatus CheckCard card visit any of our convenient locations. To report a lost or stolen card, simply call Cincinnatus at (513) 661-6903, or (877) 661-6903 as soon as you realize the card is missing. Cincinnatus will cancel the card immediately and order you a new replacement card. After business hours you may call toll free at (800) 472-3272.